Those are a bit like roman numerals, but different enough to be unique. Nice work. Everything is really neat (the weapons have some issues, but I'd be willing to overlook that for a small fee*). Especially the artwork. You bet i am. Jobs won't hire me until i get my degree. I really want to work at some sorrta game comany. Course if it was one like Maxis it would be a dream come true. Naucean is a tropical planet with large oceans. There is one main conetent, 3 smaller ones and countless small islands and shallows. The River Tribe is located on the largest continent. Cool planet. Is it CGI? 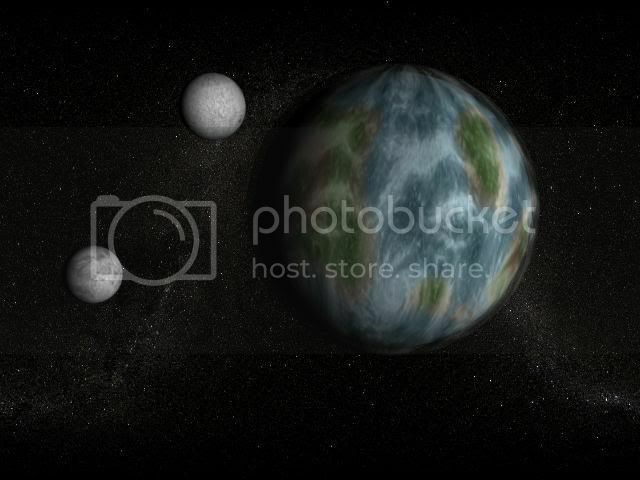 Planetoid, I'd say, but yes. Awe crap it is. Hmm i guess i beter chnage it. I was looking through my mithology book and came across a water related Inuit myth. BTW the other is the latin name for manatees and sea cows. I can only assume you have oodles of fun doing all this. I might, but I just don't have the patience to sit down and think it all up. Its fun, they will be ready when Spore comes out, it spawns more ideas, and i love having people see it and say good thing about it (even bad if it constructive). Yah the thing i i think seeing as i'm no artist i'll need to make up my creatures heritage myths Lore and suchforth when i have them curse my lack of abilitys.